Stephen Metcalf has an essay at Slate on John Ford’s THE SEARCHERS with the dead giveaway title “The Worst Best Movie: Why on earth did The Searchers get canonized?” I have to place myself in the same camp as Metcalf, at least in terms of the “all-time greatest” accolades with which THE SEARCHERS is garlanded. I like the film some, but that #8 is for a very weak year, at least in the terms of the films I have seen. Only the Top 4 for that year would I unhesitatingly call “great.” Middle-of-the-pack films by Fritz Lang and Alfred Hitchcock (both of whom I much prefer to Ford in general) are ahead of THE SEARCHERS, and of the 10 years surrounding 1956, only in one other would it be in my Top 10. Now THE SEARCHERS starts out with the flaw that I am not the world’s #1 fan of Westerns and think John Ford had some intrinsic flaws as a filmmaker, from overscoring with hammer-over-the-head music to horribly unfunny “comic relief.” I’ve now seen the film three times (never in a theater, though), and both repeat viewings reinforced my position on it — uneven, with brilliant and unbearable sequences in about equal measure, the brilliance becoming more brilliant with time and the unbearableness becoming more unbearable. The early Comanche raid on the cabin is brilliantly staged and cut; Ethan’s arrival and all the various subtexts are handled with unFordian nuance and tact (like the way the sister-in-law caresses Ethan’s uniform when they leave on the raid); the family burial is quietly moving; the teepee meeting with Scar a nervy but stoic portrayal of two men who know that honor requires that they kill each other tomorrow. And John Wayne (with one major reservation noted below) gives a brilliant performance as Ethan, easily his best, as a man teetering on the edge of sanity — I don’t agree with Richard Schickel’s complaint in Schickel on Film that Wayne’s performance is not sustained. This very “unevenness” — Wayne shifting in between darkly menacing moments and his more-customary gruff geniality — is what makes the portrayal effective. You don’t know which Wayne you’re gonna get, and when he can keep the mask of sanity on. Nor is this admittedly short sequence the only flaw in this vein. Several of the characters are just as caricatured as Luke: Vera Miles’ suitor, Mose, the cavalry unit’s leader, Mr. Jorgenson. Those who play these cartoons play down to them well enough, I suppose, but I didn’t laugh once, primarily because the film isn’t a spoof. In every scene involving Mose, I think ‘what could Howard Stern’s Stuttering John do with this role?’ Jeffrey Hunter is a callow nonentity; compare Michael Caine and Sean Connery in John Huston’s THE MAN WHO WOULD BE KING to see what can be made of a boys’ genre piece about two men on an epic quest, one of whom goes batty, when the casting is strong for both lead parts. The fight between the suitors seemed ritualistic in all the worst senses of the word. Maybe chicks in the 1870s (or 1950s) were different, but that closeup of Vera Miles beaming (in her white wedding dress, no less!!) as her two men fight over her, just seems to me like the worst sort of patronizing macho wish-fulfillment that feminists would like to think defines the male mind (sic). The last significant plot point, Wayne’s picking up Natalie Wood, is much praised, but to me and Metcalf, it just seems like an arbitrary wuss-out and a way to create a critical puzzle that can never be solved. Nevertheless, there is no gainsaying the famous last shot of THE SEARCHERS, though its point — the gap between the civilizer and civilization, and how the man who creates order does so on behalf of an institution toward which he is fundamentally an outsider — was explored much more effectively by Ford in THE MAN WHO SHOT LIBERTY VALANCE (here’s G-Money on that film). But such skepticism is a minority view among hard-core film buffs, as Metcalf notes, making many of the same criticisms I just did. For a quarter-century now, THE SEARCHERS has consistently ranked among the top films of all-time in critics polls. In the decennial Sight & Sound poll (as close to a BCS system as the film-geek world has) THE SEARCHERS first placed in the Top 10 in 1982, when the poll was all critics. Since then a shift and a gradual dropoff has occurred. The 1992 poll had Ford’s film placing fifth among critics, but nowhere in the Top 10 among filmmakers. The 2002 poll showed the same split, though at a somewhat lower level, with THE SEARCHERS finishing tied for 11th among critics but barely in the Top 30 for filmmakers. There’s no doubting THE SEARCHERS’ influence on a handful of American directors, but, as the S&S Poll numbers above show, its cachet among film-makers is slipping and now primarily belongs to critics. Metcalf kind of acknowledges this, referring only to the first generation of film-school-educated directors. I think this hints at an explanation for THE SEARCHERS continuing popularity among critics. In his very good essay on Ford, Schickel makes the point that many critics of his generation (he compares his reaction to generational cohorts Lindsay Anderson and Andrew Sarris) “had his eyes opened to the notion that movies might be something more than an instrument for fantastic escape from childhood constraints, picked up his first hints of film’s larger possibilities as an expressive form, and made his first inchoate emotional responses to that form … because of John Ford’s pictures.” I wrote a little bit below about the Warner cartoons and myself, noting that one of the first things a critic does is grapple with the (largely, but not totally, pre-critical) opinions of his childhood. Such eminent critics and champions of Ford today include Jonathan Rosenbaum and Dave Kehr, who would also fit Schickel’s description, at least in terms of the raw data of year of birth. Though it doesn’t focus on THE SEARCHERS, Rosenbaum’s 2004 essay in Rouge on Ford’s THE SUN SHINES BRIGHT is a perfect example of combining an intensely personal boyhood love, autobiography, and one’s adult sensibility. But with me, no. Ford made his last fiction film the year I was born and had died before I ever heard of him. My eyes were first opened to cinephilia by Hitchcock and Wilder from the past, Kubrick and Scorsese from the then-present, and Bergman, Fellini and Kurosawa among the furriners. I don’t think these factors are unrelated. Living my boyhood in another country, I don’t think I ever watched more of any Western than a TV promo clip. The whole genre just seemed bizarre to me. 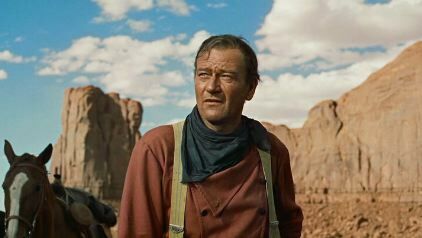 Also John Wayne was not the mythic presence, the very embodiment of “us,” that he was for Americans. While I no longer dismiss the Western tout court, the mythic love that Wayne and Ford could once tap into, and the residues of which remain forever, cannot be assented to, only unconsciously absorbed.